Monterey, CA—Well-known local author, Randall A. (Randy) Reinstedt and friends have begun a fund raising campaign in an effort to raise $15,000 to pay for a historic book giveaway in the fall of 2013. In an effort to share the area’s rich history with a larger audience, Reinstedt is hoping to raise $15,000 to distribute, free of charge, 1,000 books to the community. In order to reprint More Than Memories its pages have been transferred from film to digital, preserving it for all time. The preservation and printing of this 342 page book brought the total cost to $20,000.00 ($20.00/book). The Reinstedts have contributed $5,000 which is 25% of the total cost of $20,000 for 1,000 books. Their friends suggested that the community would be willing to contribute to this worthy cause and help make up the difference. Thus, the launch of this fundraising campaign. Randy has over 350,000 books in print and is known throughout California as a writer, teacher, history buff, and teller of tales. He is one of those writers, important to American letters, who choose a comparatively small arena - some special place - explore it completely, and offer the findings to a fascinated world at large. Of all of his many publications, More Than Memories is closest to his heart. A quarter century after its original publication, it remains his enduring gift to the people of the Monterey Peninsula and all who cherish this special part of California. 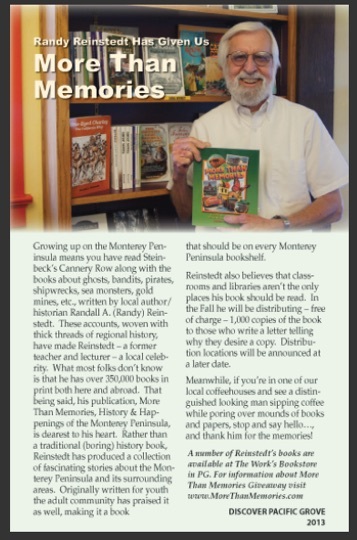 With generous community support, the first printing of More Than Memories was distributed in 1985 - free of charge - to all fourth-grade classrooms on the Monterey Peninsula. In 2001, with the edition of a new chapter called “History in the Making,” the book was made available - again free - to schools throughout Monterey County. Now, More Than Memories is ready for a new generation of residents. Mr. Reinstedt believes that classrooms and libraries aren’t the only places his book should be read. He would like this next printing to be distributed free to all ages who are interested. Of course, this latest edition will also be distributed to schools (public, private, charter, and home) and libraries, and a number of other worthy distribution points as well. To effectively select 1,000 recipients for this gift we will ask them to submit a “request form” (available at Getthebook@morethanmemoriesbook.com) explaining why they are interested in obtaining a copy of the book. Once these requests are collected the times and locations to pick up their free copy will be announced in the fall of 2013. Participants will be notified via email, official website postings, and through local media public service announcements. The ACTION Council of Monterey County has agreed to serve as fiscal sponsor for the More Than Memories book giveaway. All donations are tax deductible to the fullest extent of the law. Checks may be made payable to: ACTION Council/More Than Memories, c/o ACTION Council of Monterey County, 295 Main Street, Suite 300, Salinas, CA 93901.